How to watch Teen Titans Go! : Season 2: Boys vs Girls / Body Adventure on Netflix South Africa! 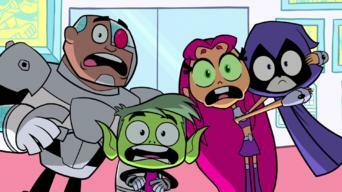 Yes, Teen Titans Go! : Season 2: Boys vs Girls / Body Adventure is now available on South African Netflix. It arrived for online streaming on January 1, 2018. We'll keep checking Netflix South Africa for Teen Titans Go! : Season 2: Boys vs Girls / Body Adventure, and this page will be updated with any changes. Robin goes on a mission to find cooties during a battle of the sexes; The other Titans shrink themselves and take a gross journey into Cyborg's body.